Savvy Mode: Louboutin Vs. L.A.M.B. I don't know of many gals who have enough will power to resist a pair of beautiful Christian Louboutin heels. However, the retail price often stop many of us dead on our track. So SG is always on a look out for savvy replacements. I adore this pair of Louboutin peep toe heels but hate the retail price of $895. Instead I found a similar pair in tan by L.A.M.B. for a savvier price of $320. So which do you prefer? 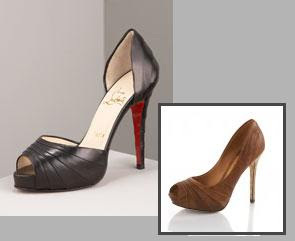 I like the black ones for a more refine style but the tan/brown pump will be great for a casual chic look. mmh they are both great dear for varying looks so its super hard to choose between the two. think the black ones are possibly more versatile,from jeans to s pretty cocktail dress. if you do chose one,let us one. Ohh I just love Louboutins...L.A.M.B. is fantastic too, but I think I'd much prefer a Louboutin instead! Plus, I'm a fan of black, especially with shoes because of the versatility of it! You know, I like the LAMBs better. I love them both... but actually, the L.A.M.B. just might be my favorite. The Louboutins look more substantial, and they should for the price. Louboutin are surprisingly comfortable. They don't look like it with those sky high heels but they are nice. i love louboutins, but i think in this particular case i may have to go with the LAMB, just because this is the one CL i'm not too fond of. ps - i totally agree with your motto! They're both fantastic looking shoes but my flat feet just cannot deal with thin heels. Ohhh definitely CL, but they are soooo pricey althought CL shoes are on my wish list for 09! my vote is for the loubs. something about the LAMB looks a little off. Rachel: LAMB as far as i know only come in the brown. it will be better in black, i think.